A Master Artist who is always searching for perfection, Michel Heurtault wants to bring umbrellas and parasols back to their former glory. He is recognized today as French haute couture’s foremost creator of umbrellas and parasols, but his passion started when he was just eight-years-old, and loved to disassemble umbrellas to understand their mechanism. Today, he continues to study the pieces of his historical collection to observe the particulars of each period and learn from the different cutting and assembling techniques used throughout the ages, in order to create complex new shapes. Before founding the Parasolerie in 2008, Michel Heurtault was specialized in historical reconstructions and costumed balls for the French and international elite. In his workshop, he created costumes for the cinema and theatre, and corsets for the best haute couture houses. Today, his experience and know-how are solely focused on the Parasolerie. 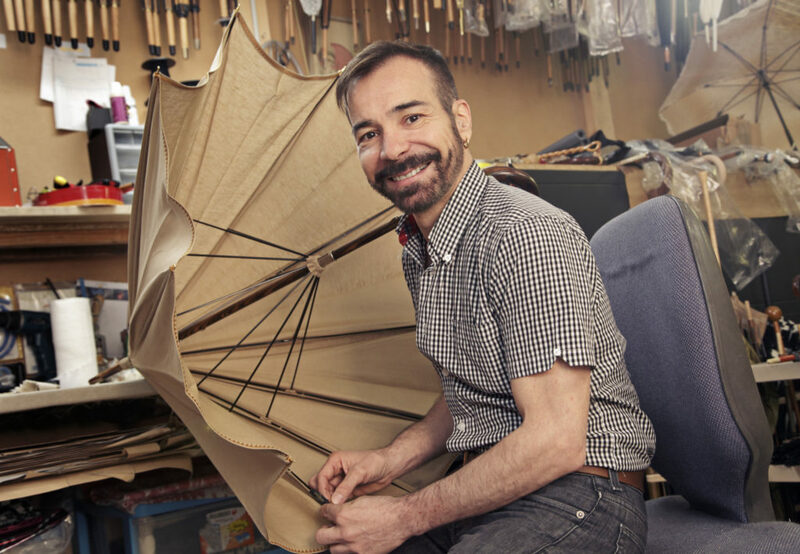 Michel Heurtault is not an “umbrella maker” but a creator of umbrellas and parasols. All his creations are produced in his Parisian workshop. In 2013, Michel Heurtault was awarded the title of Maître d’Art [Master Artist] by the Ministry of Culture, France’s highest honour for an artisan. It is the French equivalent of Unesco’s National Living Treasures. Created in 1994 by the Ministry of Culture and Communication, the prestigious title of Master Artist is held today by 124 French master craftsmen and women. It recognises French artists for their excellent career, a unique know-how and their dedication to the revitalization of artistic crafts in France. Awarded for life by the Ministry of Culture and Communication, the title honours exceptional careers and often a unique know-how and technical mastery, but mostly entrusts those who receive the distinction with a mission: to transmit their know-how to a student who will be able to reinvent it and to build a future with it.